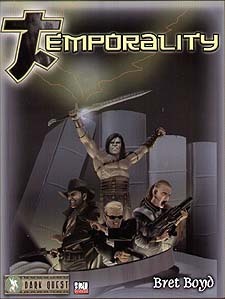 Temporality provides a unique and easy toolbox of ideas concerning time travel and how to incorporate it into your game. New and unique rules for d20 examine time travel as well as reincarnation, new feats, magic items, organizations, villains and monsters. A large chapter concerning existing spells in the context of time travel is offered, and The Continuum, which keeps all other Flows from merging into each other, is looked at from the perspective of safe areas called Havens - where sections of land (usually) from the Material Plane are replicated and its surprised inhabitants taken along for the ride. There are limitless adventure and character ideas which Temporality conjures up. No longer do adventures need to plod along from Point A to Point B. Stand mundane thought on its head and expand your campaign with the power of time!